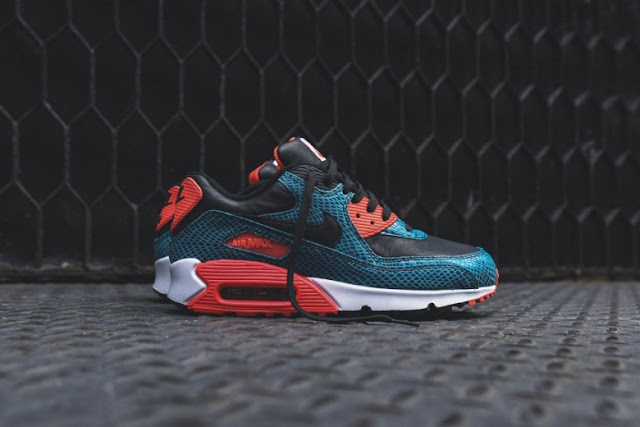 Nike Air Max 90 Anniversary "Dusty Cactus/Infrared"
Continuing Air Max celebrations for its 25th birthday, Nike has released another commemorative colorway for the staple silhouette. This time, a “Dusty Cactus” upper comprises the shoe, with a beautiful leather snake-embossed teal panel. Matched with classic infrared accents, the shoe is completed with a crisp white outsole and black paneling. Available now for $135 USD over at KITH Manhattan through e-mail orders only.